With autumn well underway, you will be ready to embrace your winter wardrobe and get your warmer clothes out. Trying to keep warm and battle the elements doesn't mean that you have to compromise on style, here are some tips and advice on how to layer up and look fashionable this winter! Now is the time to say farewell to your summery pastels and say hello to warm, autumn tones inspired by nature. Year after year, our favourite autumn shades are mustard yellow, brown hues, oranges and red with rich purples and navy. If you establish a colour palette and buy just a few items of each colour, you can mix and match for chic and well thought out outfits for the whole season. Keep your bottom layers simple and plain, like a pair of slim fit jeans. During the autumn and winter months you can still enjoy skirts and dresses by wearing thicker materials and wearing over tights with a pair of nice boots. 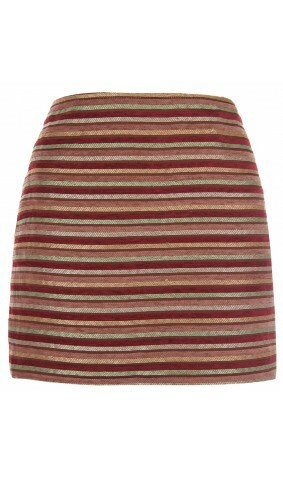 We reccomend this gorgeous Jacquard Aztec Pattern Skirt; the perfect look for autumn! If you would like to see more of our limited edition clothing, you can shop our full collection here.